Beneath the surface of this world, and often beneath the surface of our skin, lies something hidden. Something strange. Something… unusual. It is an invisible world filled with all sorts of creatures. There are the aches and the rashes. There are the hungers and the thirsts. There are itches and the scrapes. And for most of us, we would be happy if they never paid us a visit. This is the world of the Niggles. In this world, everyone has a job to do and everyone tries to do it to the best of their ability. Most of them are in fact quite friendly, even if their job makes us feel upset, annoyed or irritated. Most of the time Niggles are happy to visit someone for no more than a day or two, before going on their merry way. However Niggles also like to make friends, and sometimes, when they really like someone, they might stick around a little longer. There are many different kinds of Niggles, but the most common Niggles live in Nigglesville where their super-effective taxi service can take them to anyone at anytime (and in only a few seconds too). Ah yes, Niggles might seem a little strange, but just remember, if you ever find yourself being visited by one, don’t blame them for doing their job – often they are only letting you know that something isn’t quite right with your body. Perhaps you have a belly-ache because you ate too much food. Perhaps you have a rash after walking through poisonous scrub. Maybe you cut your toe on some sharp rocks. Whatever it is, without a Niggle, you’d never know. Aches and pains – that’s the job for these three friends. There was a time when all three were super busy (just how Niggles like it). These days, people try to avoid aches and pains as best they can, so things have slowed a little. Leaf loves to take peoples’ thoughts just as they are bubbling up to the surface. Fresh thoughts make the best Niggle juice, which of course is a Niggle’s favourite drink. Titch is one of the few Niggles that enjoys friendship a little more that his job. Unfortunately being a ‘no-reason-at-all’ itch, makes this endeavour quite difficult. Ingle is great at spotting people who are about to hit their elbow on something hard. If she’s quick enough, she can get to the person before Jake or Rake. She likes to think that her tingle feels better than any ache, although perhaps some would disagree. Tash loves the feel of irritated skin. Smooth, soft skin is so over-rated. In the past, Tash didn’t get too much work, but now it’s all busy, busy, busy. If Tash comes across irritated skin, she’s all over it and unfortunately Tash often has the tendency to become very attached. Mr Blister is very old, upright and proper. He is always reminding people of the simplest things. Don’t touch burning or frozen things. Don’t keep running in wet socks or footwear that doesn’t fit. Stay away from chemicals if you don’t have proper safety equipment. All sensible things. Unfortunately he has learned that people are often far from sensible, and so when someone forgets, Mr Blister will usually stop by to remind them. Felausia is a bit of a detective. She likes to hunt down anything that hurts a person’s body from the inside. When she finds something, she will sneak inside the body and use her special tools to try and remove the problem. Growing bodies is Munger’s specialty. Nothing gets him more excited than children who learn and play hard through the day. Munger is by far the hardest working Niggle, as growing children are always needing good food. Sometimes though, if he sees children eating too much bad food, he will let Jake or Felausia know. Sooner or later they will probably need to stop by. Kirsty knows the importance of staying hydrated. She likes to watch children as they play outside, however she knows that sometimes when you’re having fun, you forget to drink. If Kirsty notices someone becoming dehydrated, she will leap onto them and whisper in their ear until they listen. Bridget loves two things – boredom and people who have to sit still. She can’t help herself. When she see’s someone bored or trying not to move, she just wants to leap all over them. In fact it’s her favourite game. If the person moves, she wins! Mallory is often at her busiest when the months get warmer or in places where pets are around. Mallory is as light as a feather and can travel on the wind. On some days, she can pass a hundred or more people whom she loves to greet with a special kiss on the nose. Print out the above page 3 times. Cut out each Niggle and paste them onto a piece of cardboard the same size (old cereal boxes work well). 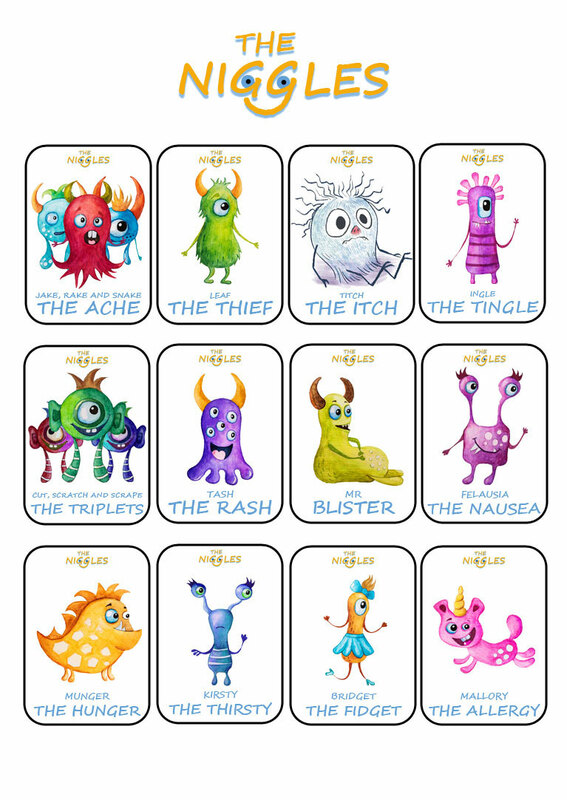 You should now have a deck of 36 Niggle Cards that you can use for the games below. Shuffle all the cards and divide them evenly among players. Each player should have a single stack of face-down cards. No one can peek. Choose someone to go first (remember to take it in turns). As quickly as possible, that person places their top card face up in the centre of all players. Moving clockwise, each player does the same as quick as they can. If two of the same cards end up on top of each other, anyone can quickly place their hand on top of the face up pile and call out ‘SNAP’. In the event that two or more players do this, the player with their hand on the bottom wins. The winner takes all the cards, shuffles them and adds them to the bottom of their card pile. The player who ends up with all the cards, wins! If at any time, someone SNAPS incorrectly, they are unable to snap for three turns. Remove one card of each Niggle type. Remove an extra card from Mister Blister. Deal the cards out as evenly as possible. Don’t worry if players have one card more or less. Players can look at their cards, but should keep them hidden from other players. All matching pairs are shown to other players and then placed into a centre pile. Choose a player to go first (remember to take it in turns). This player chooses a card from any other player (they can’t look at the card until it has been chosen). If they can make a pair, they show everyone and place them in the centre pile. If they can’t, they do not take any further action. Moving clockwise, each player follows these same actions. Play continues this way with new pairs being placed in the centre. By the end of the game, all the cards will be in the centre except Mr Blister, the Old Niggle. The player left holding Mr Blister loses the game! Shuffle all the cards and deal six to each player. Place the remaining cards face down in the centre. Any matching triplets are shown to other players and then placed in front of the player. This player can ask any other player if they have a particular Niggle. If they do, they must give that player all of those Niggle Cards. The same player can then ask any player the same question. If at any time the asked player doesn’t have that Niggle, they can tell the player to ‘GO FISH’. The player then takes a card from the centre and their turn is over. The asked player who told the player to ‘GO FISH’, now becomes the player. Play continues this way with players placing any matching triplets in front of them. The winner is the first person to get rid of all their cards or if the cards in the centre run out first, the winner is the person with the most matching triplets. This player calls out the name of a Niggle and then flips over the top card in their deck. If they are correct, they are out of the game. If it is a different Niggle, the player to their left does the same. Play continues this way until someone is able to get rid of all their cards, or everyone is out. If any player can get rid of all their cards, they win! Remove one card of each Niggle type, then shuffle the remaining cards. Place them face down in four rows, with six cards in each row. This player flips over any two cards. If they match, they keep the cards and receive another turn. If the cards don’t match, they are flipped back over and the person to their left takes their turn by flipping over any two cards. Play continues this way until all the cards have been claimed by the players. For an advanced round, use all 36 cards. Each player flips over three cards and can only keep them if all three match. Shuffle all the cards. Each player chooses a card. Each player is given 15 minutes (or longer if everyone is in agreement) to make up a story about their chosen card. At the end of the allocated time, everyone comes together to read each other their story. For a bonus round, players might like to make up a story about a Niggle that isn’t included in the cards.